This felt like a good way to end the week. If you’ve ever wondered what really started it all, and what that first game actually looked (and played) like, here you go. First published in January 1974, the original edition rules of Dungeons & Dragons would go on to see six different printings. This edition is for the Original Collector’s Edition released By Wizards of the Coast in 2013, which was itself a revision of the 6th and final printing, the “Original Collector’s Edition” or white box edition. The Original Dungeons & Dragons (1974), by Gary Gygax & Dave Arneson, is the debut edition of the world’s first tabletop roleplaying game. It was published in January 1974. The origins of Dungeons & Dragons have been discussed at much greater length elsewhere. Jon Peterson’s Playing at the World (2012) is the premier source, while this historian’s own Designers & Dragons: The ’70s devotes a full 10 pages to the subject. What follows is only a synopsis. Origins (I): Finding the Fantasy. Gary Gygax became intrigued by medieval miniatures wargames at Gen Con I (1968). He then formed the Lake Geneva Tactical Studies Association in 1969 to support his new interest, where he was joined by Donald Kaye, Jeff Perren, Rob Kuntz, and others. However, Perren decided to do more than just play: he wrote a few pages of rules for medieval miniatures wargaming. 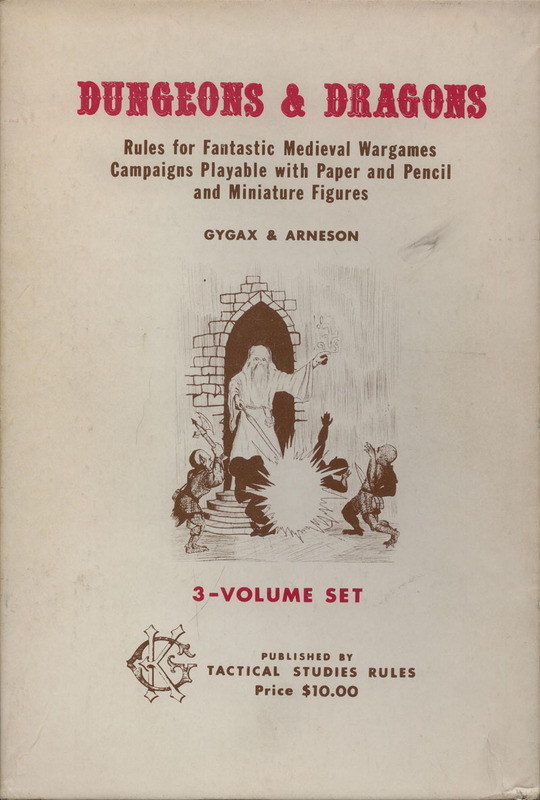 Gygax developed Perren’s rules, then published the “Geneva Medieval Miniatures” in the Panzerfaust fanzine (April 1970), later expanding them in Domesday Book #5 (July 1970). When Gygax became editor of the “Wargaming with Miniatures” series for Guidon Games he led off with a further expansion of the LGTSA Medieval Miniatures rules: a miniatures rulebook called Chainmail (1971). It included a 14-page “fantasy supplement” that featured rules for heroes, superheroes, and wizards — the last of which had spells like fire ball, lightning bolt, and phantasmal force. At this point, some of D&D’s core ideas were obviously beginning to appear. Origins (II): Traveling to Twin Cities. The next step in the evolution of Dungeons & Dragons came thanks to another collaborator: Dave Arneson. His story begins with the “Braunstein” games of Dave Wesely, who was running Napoleonic miniatures games where players took on the roles of individual characters. After Wesely’s Army Reserve unit was called up to active duty, other players ran Braunsteins of their own, sometimes in different settings. One of these was Dave Arneson’s “medieval Braunstein”, which he called “Black Moor”. Arneson used Gygax and Perren’s Chainmail game for its combat, but otherwise it followed the Braunstein idea of players running individual characters. At first, Arneson’s players fought medieval miniatures battles that were typical of the genre … other than the fact that they had characters that gained experienced over time. Then in late 1971 or early 1972 the Blackmoor group moved into the dungeons (using a plastic kit of a Sicilian castle that Arneson owned). Arneson showed Gygax his Blackmoor game in late 1972. Gygax then began to revise and expand these proto-D&D rules, publishing drafts to the miniatures gaming community in 1973. By mid ’73, he was ready to publish their game, but both Guidon Games and Avalon Hill turned him down.